Baseball is upon us! Opening Day (And Opening Weekend) is in the books and after the Marlins’ first homestand of the season, I have some early impressions. Don’t mind if I throw in the road series with the Braves stat wise. Starting with Opening Day, the crowds were great and the atmosphere was electric. Fans were rocking jerseys both new and old while kids ran around with gloves, hopeful of catching a ball. It really made Marlins Park feel like an escape, a sanctuary. A place to forget about work, forget about life in general and to just sit back, relax and enjoy some really good baseball. Remember, not everyone makes it to the majors and that fateful call up to the pros is something every player dreams of. For those already in the big show, its to enjoy every second of it and making a name for yourself. And championships, can’t forget about winning championships. Overall, I like what they did this year in giving the stadium more of a local flavor, especially when it comes to the food. Management is looking to improve the fan experience and for that, I give them credit. The ultimate fan experience, however, is what’s out on the field. The Colorado Rockies came to town to inaugurate our 2019 season and despite hitting three home runs, the Fighting Fish went down 6-3. Our opening day starter Jose Ureña was dinged up for four in the fourth while the offense only managed four hits. Trevor Richards took to the mound in the second game. He had a much better outing lasting six frames, giving up only a run. The bullpen fell apart in the ninth, coughing up four runs in route to a 6-1 defeat. 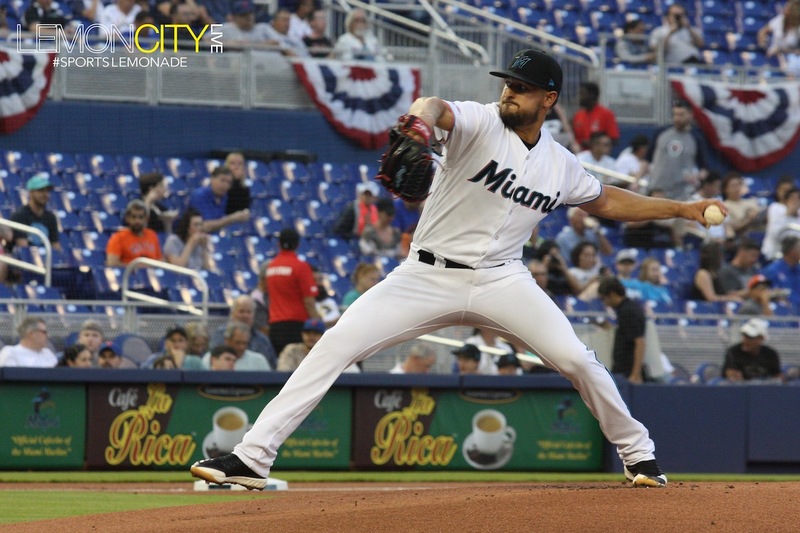 Miami recovered nicely to split the series with quality starts from both Pablo Lopez and Sandy Alcantara over the weekend. And then came New York. The Mets flew down to South Florida for a three-game set, sweeping the Marlins in the process. On Monday, the Marlins jumped out to an early lead courtesy of Starlin Castro’s first home run of the season but once again the bullpen faltered in the ninth. With that said, the team had a chance in their half of the inning with the bases loaded and nobody out. Jorge Alfaro, Peter O Brien and JT Riddle struck out. A similar situation played out the next day, this time in the eighth. Ureña got hammered for five runs in the first inning and Miami was in the process of making a comeback. The Riddler grounded out but not before scoring Curtis Granderson to put Miami to within one. Alfaro struck out, again, to end the inning. The rally came up short when Miguel Rojas lined into a double play. The Marlins finished their opening homestand winning two of seven. The series against the Braves could’ve gone better, Miami lost the rubber match under unfortunate circumstances, but it’s a long season. Granderson tied it in the ninth with some late game heroics but a timely hit against Adam Conley and an interference call on Chad Wallach doomed the effort as the Braves walked off with the win. After the trip to Atlanta this weekend, where do we stand? 10 games in, two guys stand out the most: Starlin Castro and Jorge Alfaro. Surprisingly, Castro leads the team in batting average (.300), On-Base Percentage (.317) and Hits (12). Didn’t really expect that. At one point, Starlin was even tied for first with Riddle for dingers. Following a pair of round-trippers Sunday afternoon, however, Jorge Alfaro leads the team in HRs (3) and RBIs (6). To indulge your curiosity, Prado leads in doubles (3) and Granderson leads the team in walks with six. Brian Anderson has the dubious early season lead in strikeouts, with 11. He isn’t the only one whiffing. Lewis Brinson, Alfaro and O’Brien follow close behind. Speaking of Anderson, he is currently hitting .158. A slow start but he’ll heat up. Despite these struggles, there are some bright spots kinda. Martin Prado was hitting .476 in 21 At-Bats and Rojas slashing .292/.346/.375. What about Brinson? Remember last year he had a very bad start to the season but after a decent spring, he’s holding his own, for now. As a team, the Marlins were hitting an anemic .235 after 10 games although this is balanced out with our opponents hitting .238, reinforcing the idea that our pitching is what will keep us in games. As previously mentioned just about everyone but Ureña has had a good start to the season. Although Lopez himself took a bit of a stumble with Friday night’s 4-0 loss to Atlanta. He surrendered two home runs in the losing effort, both in the fourth where Atlanta did all the damage. If anyone is acting like our ace, it’s Sandy Alcantara. Out of the entire pitching staff, I believe he’ll have the best year. Our official ace meanwhile is 0-2 with a 10.38 ERA, he’ll turn it around sooner or later. Last year he didn’t win his first start until June 5th, after over a dozen starts. He’ll get his first win sometime in April. Heading into Monday, the starters have thrown 54 innings with 50 strikeouts, 16 walks and a 4.67 ERA combined. So far they’ve given up six dingers and 53 hits for those keeping score. Solid numbers since this will be our team’s strength this year. Despite their struggles, you can find a couple of standouts: Austin Brice and Nick Anderson. Brice has tossed five scoreless innings in relief, fanning four and walking a pair. If you like that you’ll love this. Anderson is definitely creating buzz because in just 4.1 innings of work, he’s accumulated 10 K’s with just one earned run. If this keeps up, I’d look to give the kid closing duties. Conversely, veteran Sergio Romo has stumbled early on. A likely candidate for the closer role prior to Opening Day, his ERA hovers at 12.00 with three innings pitched. It’s still very early, he’s a work in progress. As is Drew Steckenrider who’s pitched five innings, giving up four earned runs. Combined they’ve thrown 32 innings with a respectable 3.38 ERA, collecting 38 K’s, walking 14 and allowing two rounder trippers on 26 hits. Forget about attendance figures. Forget about competing. It’s year two of the rebuild and this is the year the team has to show the fans something to look forward to. The fan base is small, but those that remain after all the years of fire sales and false promises clamor for relevancy. Clamor for just winning. Patience remains the word of the day, but we’ve heard this before. So why should now be any different? First off its Derek Jeter who is trying to put together a winning ball club and second, there is a lot of promising young talent both on the field and in the minors. During the winter off-season, the organization has rebuilt its apparatus from the ground up, farm system included. It’s all about watching hungry youngsters develop and with any hope, the front office will not only endeavor to nurture these kids but retain them. That last part for the fans, is particularly important. Keep the faith Marlins fanatics, better days are ahead. If only we knew when. The Lemon Drop – Fish Cutting Bait?